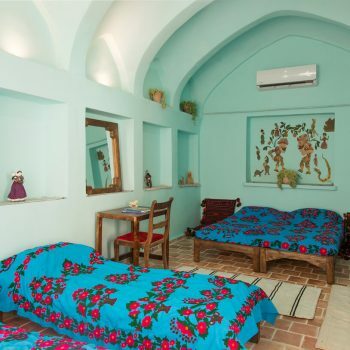 In a historical area of Kashan, just at the heart of the all-important visiting sites and astonishing buildings and monuments, Puppet Museum Hostel can be found. Kashan’s unique “Puppet Museum Hostel” is a charming low-budget accommodation, in a beautiful historical house, with a unique collection of cultural traditions which includes a wide range of traditional puppets and toys and shows featuring them. The house consists of a beautiful courtyard which connects all the spaces, five private rooms, two dormitories, two public bathrooms, a lounge that provides a place for interaction, and the puppet and toy museum itself with its cafe and souvenir shop at the basement level and a kitchen. Tea is always ready for you, and you can spend hours sitting and chatting there, reading books from the shelves and tasting different local herbal flavors with your tea which have brought Kashan its fame through history! 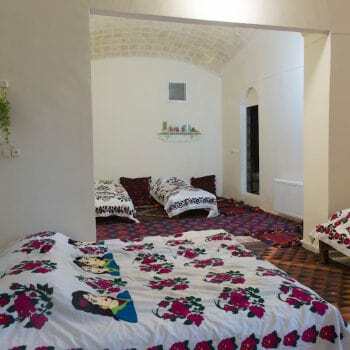 All rooms have a special atmosphere due to their unique Qajar-era architecture style and they are all decorated with local and handmade furniture. Each room has a theme with toys and puppets from different cultures. There are air conditioners in all rooms for more comfort and three rooms have their private bathrooms. The staff are very friendly and do their best to create the most amazing experience for you in Kashan. Feel free to ask them what they are up to any time! 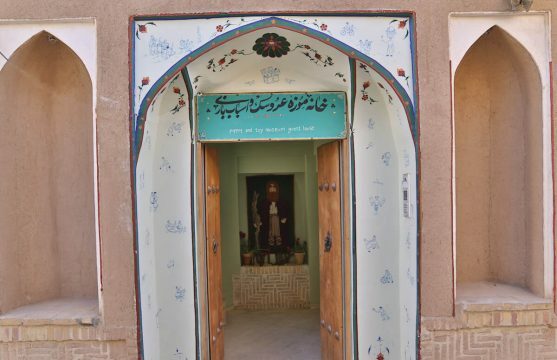 The unique “Puppet Museum Hostel” started when the founder, Amir Sohrabi, came across a collection of Qajar (approximately 130+ years) era toys. Amir Sohrabi wrote scholarly papers on the topic and also did an exhibition of the toys. Ultimately, he wanted to dedicate a traditional house to toys, dolls and puppets. And he did it. The museum plays an important cultural role in preserving local art and crafts. The variety of museum items engages people of all ages. Furthermore, it hosts various events from workshops to performances. After launching the museum, accommodation spaces were made with the goal that they would create more interaction and build stronger cultural connections. 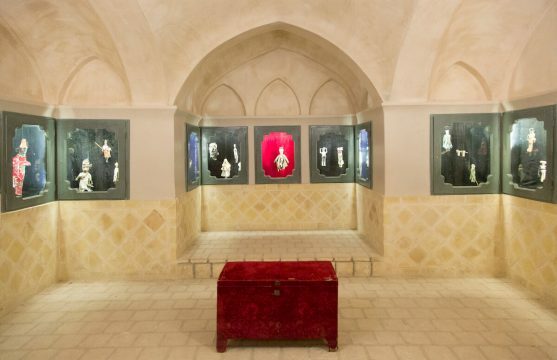 In addition to being a museum, the building is the former house of a Qajar-era poet and cleric, Jafar Allameh Feizi, who is a descendant of the famous mystic Faiz Kashani. The house is recorded as one of the national heritage sites in Iran. Through your stay you can visit the museum, and maybe participate in one of the workshops and events. Antique and contemporary toys (from clay, stone, wood, pottery and fabric toys to metal and plastic toys). Plays: Iran traditional puppet show, ritual dolls and ceremonial performance, Iran traditional music, Iran folklore performances, etc. Workshops: toy and doll making, traditional games, etc. Mobile puppet & toy museum: which travels around other cities and countries to represent parts of the museum’s collection and connect with other cultures. Museum shops with old and traditional puppets, dolls and toys and other souvenirs. Museum café and restaurant with regional cuisines and drinks in museum’s courtyard. Kashan, a city in the desert, is connected to Karkas Mountains from south and central deserts of Iran from north. 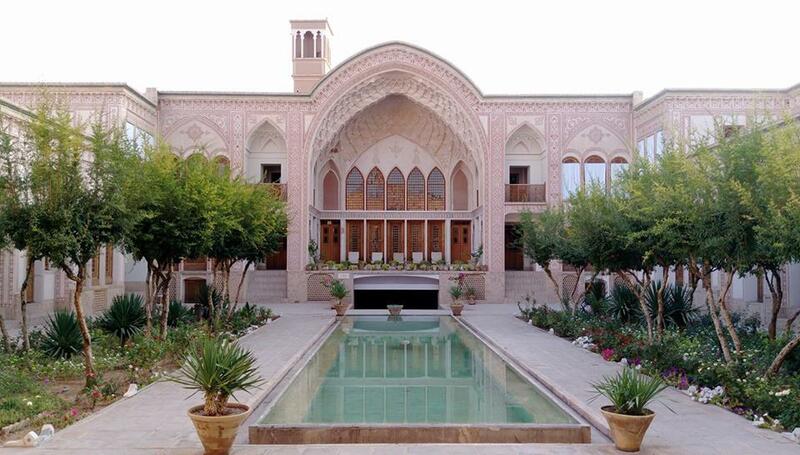 Kashan comes along with a few things in our memories: roses, herbal extracts, Qanats, architecture, people and more! The city hosts one of the oldest civilizations ever known called Tape’h Sialk which dates back to as early as the 4th millennium BC. Kashan is famous for its textile, ceramics and pottery from Seljuks Period (AD 1051-1220) which are still at work. Shàr Bafi is the art of making silk and textiles! It’s a nice experience to watch the artisans doing their work and listen to the music of their machines while making the fabric. Kashani architecture has a unique style, there is no single house with the same plan! Simple mud walls and complicated internal spaces! 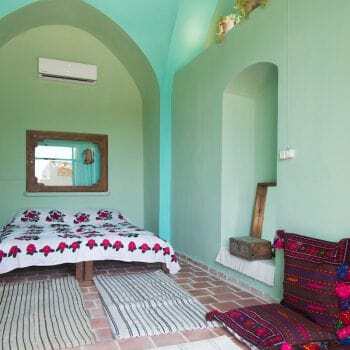 Boroujerdi House, Tabatabaian House and Abbasian House are a few examples! The other interesting layer of architecture’s engagement is the kind of spaces created by people and different communities which represent simple infrastructures and lifestyles but complicated relationships! Sultan Mir Ahmad traditional bath, Fin garden which is one of the few remaining Persian gardens, Kashan’s Bazaar with its Timche Amin-alduleh which is a caravanserai with a beautiful dome where you can have your tea by Mammad Agha, are the other unique architectural spaces you can visit in Kashan. Kashan makes one of the best examples of urban development by tourism in Iran. Government and the people participated together in this process. Alavi Street was the turning point of changes which hosts the most historical icons in Kashan now. Kashan hosted around 140,000 foreign travelers and tourists in 2017. But tourism and travelling culture is still new to the locals. Kashan was almost demolished after an earthquake which happened around 250 years ago. People renovated their houses, neighborhoods and the whole city! Kashan has one the most welcoming people in Iran, don’t be surprised if you find a Kashani sitting outside his house, eating watermelon and offering you some! Kashan used to have a Qanat system [traditional water piping system] and permanent water springs which mad animal husbandry and agriculture part of their activities. Roses which grow in this region are famous in the country and have helped the tourism industry in the last few decades. You will find rose-water, oil and drinks made by roses everywhere. Try Haji Badum and Kulucha (sweets from Kashan) with your rose-tea! There are other places you can visit around Kashan.Niyasar is a village 1710 above the sea level.In Niyasar you will feel a big difference in weather conditions. There is a Sassanian-era fire temple, a Pathina-era cave built as a Mithraist temple and a waterfall nearby. Qamsarwith its rose bushes is where you can find amazing rose gardens in April and enjoy the rose water celebration. They have a culture of Gol-Ghaltan which is to take a rose water bath for a new-born baby. And don’t miss an evening in Abu-zeyd Abad Desert for watching the sun set and rise again.